I mentioned yesterday that I found the one multi-team card I need for my set by buying a 60+ card lot from a dealer. He had a pile of the “Rookie Stars” cards and some various inserts that he apparently couldn’t move otherwise, so he lumped them all together and I bought them for $2 and free shipping. It was a win-win for me as I got the one card I needed and some random trade bait that I wouldn’t have otherwise purchased. I never have a problem buying large lots like this because I figure I can always give away some of the extra cards to you guys later on. 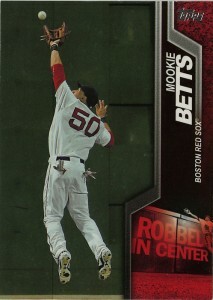 Plus, with the “Rookie Stars” cards being unofficial RCs, sort of, it might be good to hang on to a couple of them. I have a love/hate relationship with Heritage. I love the idea of it. I like the thick card stock, I like the retro designs, I like most aspects of Heritage. Then, there’s the configuration. Too many cards, too many SPs, too many gimmicks, too much complete and utter junk. This year is proving to be fairly annoying in particular. 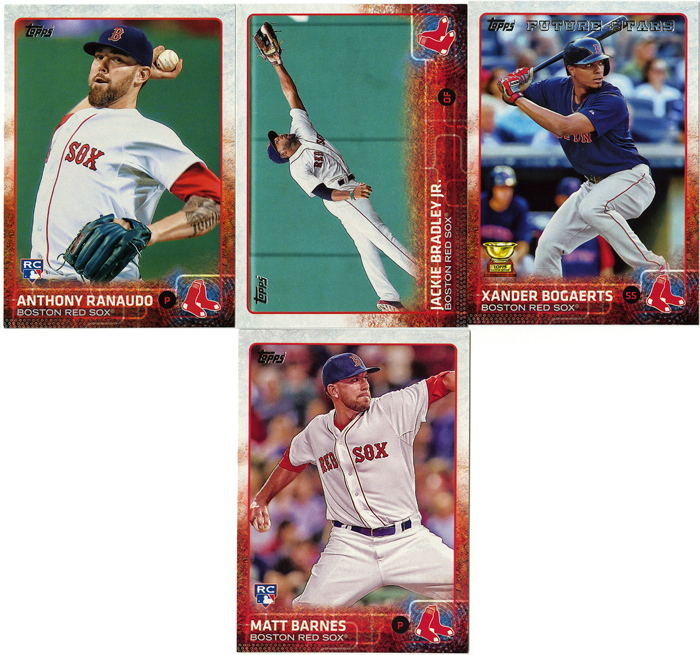 There are four Red Sox players as short prints, an image variation, gum stain “errors”, color swaps, and all manner of exceedingly aggravating things that my completionist brain is having trouble processing. Let me say this another way. SHORT PRINTS ARE RIDICULOUS. 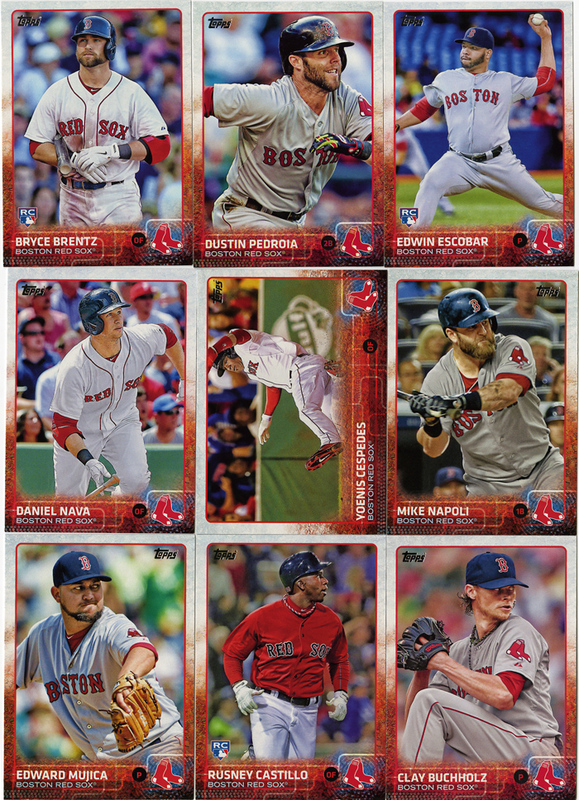 When David Ortiz and Dustin Pedroia, arguably THE two faces of the Red Sox franchise are both short prints, on purpose, not to mention Bogaerts and Hanley Ramirez, that’s when I called Shenanigans on Topps. There are 75 short printed cards. They are, in general, the 75 most popular and/or newest stars in the league. That’s terrible. I’m sorry, it is. They’ve purposely made everyone’s favorite players harder to find. Not because of some actual scarcity, or through some printing snafu, but through actual planning and forethought. I bought my team set, and found 3 of the 4 SPs from the same seller for $1, so I can’t complain about over-spending or opening too much product to try and find what I needed, but it’s really the principle of the thing. 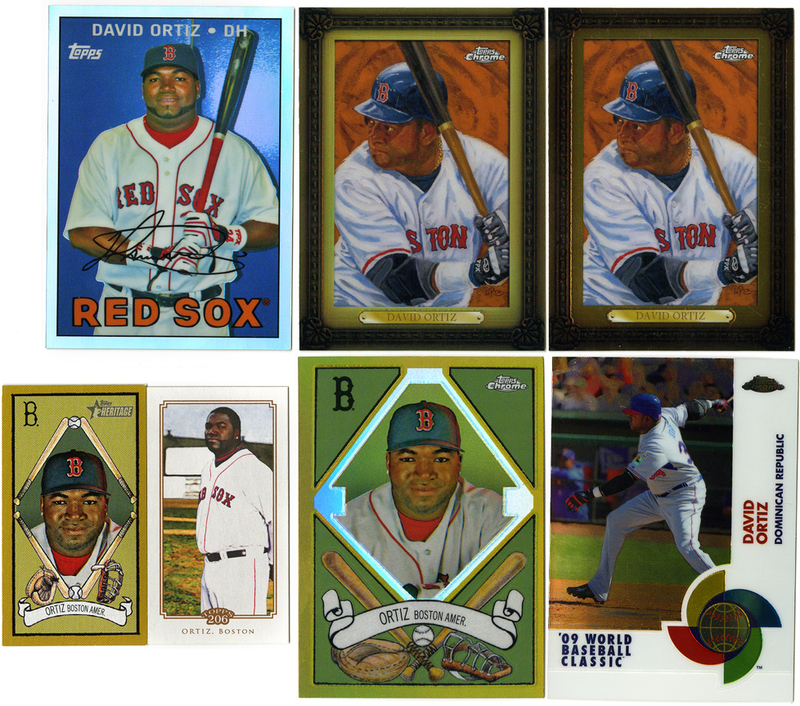 I am very sick and tired of David Ortiz consistently being the short print in every set. It’s gotten old. I’m sure those of you who collect Harper, Jeter, Trout, Hamels, Verlander, Kershaw or Puig, you can all relate. I don’t even know why I’m showing these, except to say that while I don’t agree with the product configuration, at the very least I can appreciate the cards for what they are. 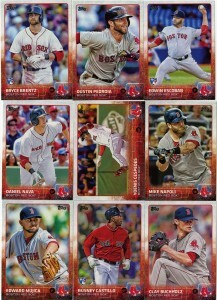 Ok, four cards isn’t a ton, but that title sounded better than “a whole lot of Swihart”. I stumbled across a seller on eBay with “rookie lots” and picked a couple of them up for $0.99 each. I had a regular copy of the two horizontal RCs, but never picked up the foil and the gold. 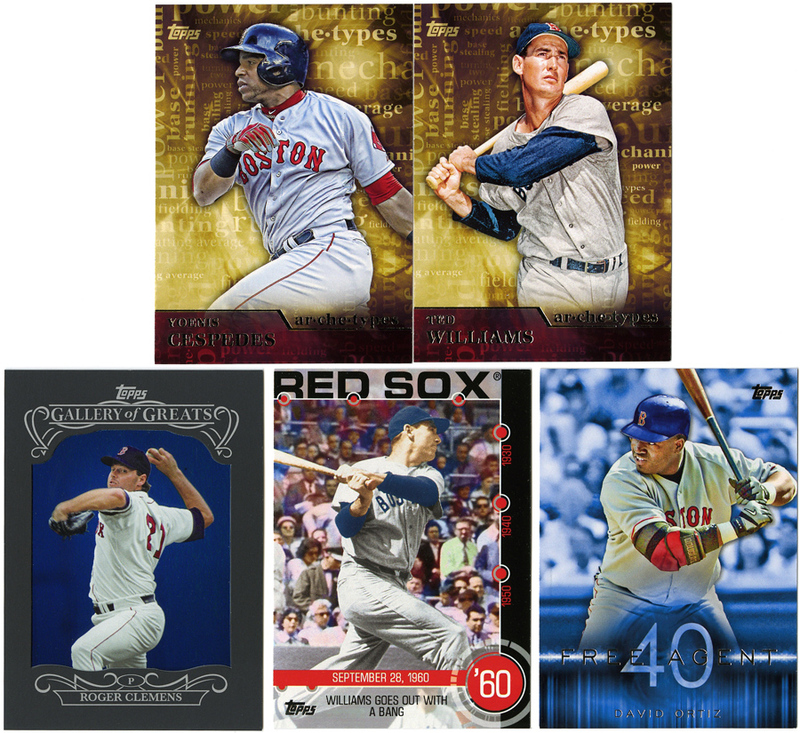 The Bowman “Top 100” was hard to find and I had never gotten around to it. The regular Bowman Chrome was the only one I already had, and there’s certainly nothing wrong with having an extra copy. 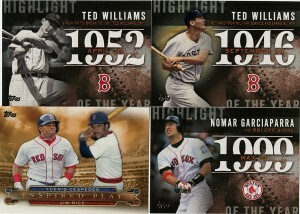 These are a good addition to Mookie’s growing section of my Player Collection binder. 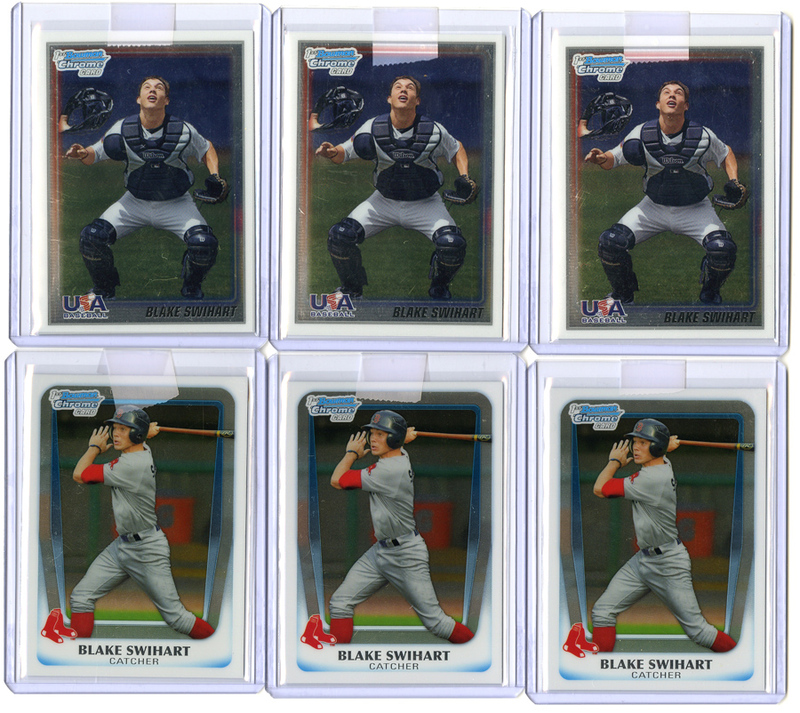 The same seller also had two different lots of Swihart cards. 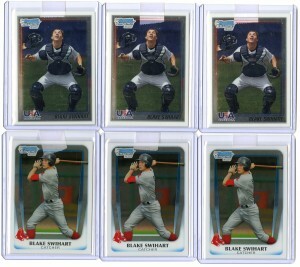 2010 Bowman Chrome with Blake on Team USA and 2011 Bowman Chrome with him officially in the Sox organization. I had a non-Chrome copy of both, and figured a few extra couldn’t hurt. Just stocking up on random rookie card. Huzzah for combined shipping! I don’t think I ever bothered to post my Series 1 team set, or my impressions on the design. To say I’m a bit behind is an understatement. Honestly, there just hasn’t been all that much to excite me this winter regarding baseball cards. 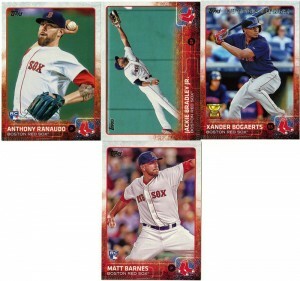 I knew what Series 1 was going to look like back in the fall, when Topps previewed the design. It’s different, it doesn’t have a white border, it’s generally not terrible. Oddly enough I find myself looking for the “foil” versions and they’ve seemingly limited them quite a bit. 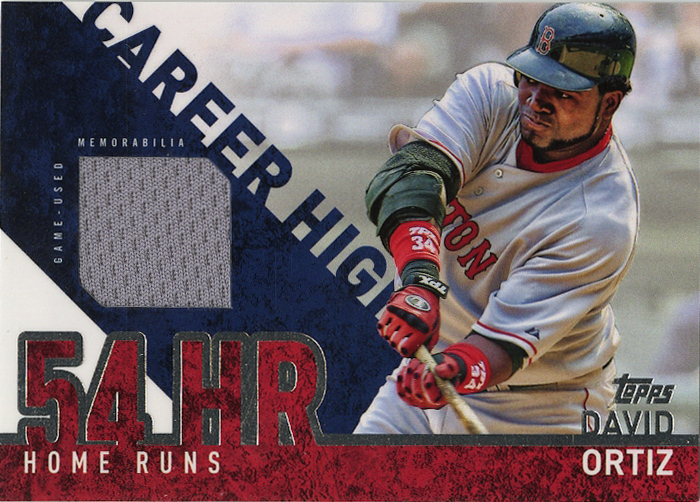 No super shiny odd-colored parallels, which is a good thing. Just a “rainbow” version which is very lightly chromed. I think they’re going to exploit the ever living heck out of that fact for Chrome this year, but that’s to be expected. I think what I was most put off by was that my team set wasn’t really complete. It’s not the fault of the seller I purchased it from, although they did the same thing for Heritage and it’s a bit more aggravating, but they compiled an incomplete set and peddled it as a “Master Set”. Again, it’s mostly Topps fault. You can’t really pre-sell something that you don’t know what the contents are going to be. In this case, it’s hard to sell a set when Topps doesn’t give you a checklist. My set was missing two inserts (one unannounced and one retail exclusive) that I had to hunt down after the fact. Normally, hunting for a card is half the fun. It’s the “sport” of collecting. If something is hard to find it’s more of a satisfaction once you find it. In this case however, they’re just inserts, cheap ones at that. The “fun” aspect of tracking them down is replaced with frustration that I have to do it in the first place. “Have to” is also relative. No one forces us to find these cards. I believe there’s a little “completionist” in all of us that needs these cards, but even that little voice needs to occasionally shut up. It’s not a bad set. The design is interesting. I like the texture it has. It’s also has quite a few rookie cards. I don’t remember another year where there were five or more Red Sox RCs in Series 1. I guess that’s what happens when you blow up the roster at the trade deadline and bring up half of the AAA team. A lot of guys get their required games to be considered rookies. I love the photo on JBJ’s card. 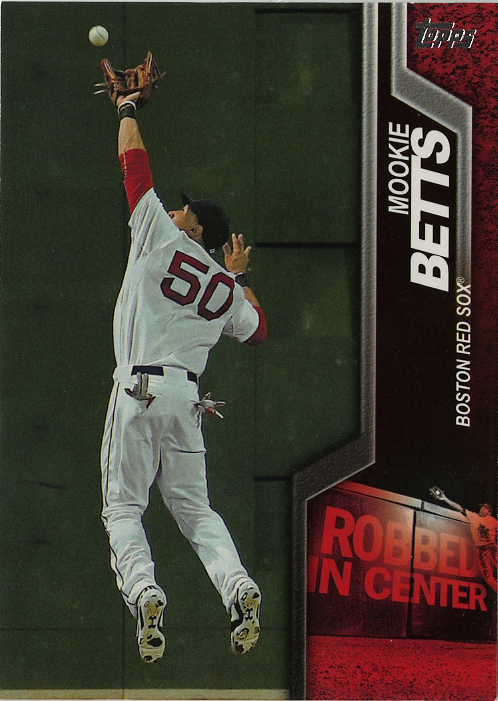 I have my doubts that he’ll start the year in the Majors, my money is firmly in the Mookie Betts camp, but it’s an awesome card regardless. Inserts time. I don’t quite understand how Cespedes is “Inspired Play” and was “inspired by” Jim Rice. 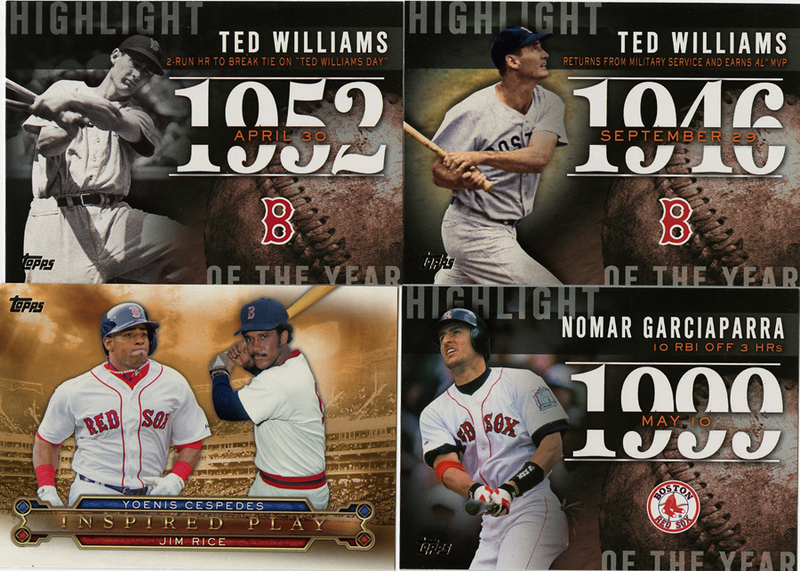 The highlights cards are kind of plain, they’re just filler. Again, I’m not getting the “archetypes” cards. I could think of about 20 other players besides Cespedes who exemplify the Red Sox and who’s playing style is an “archetype” for others. Yaz, Fisk, Rice, I could go on. The “Gallery of Greats” was one that I had to track down. Hobby only. I would have assumed that it would have been in my “Master Set” seeing as how I’m paying for “All the Inserts”, but apparently I’m wrong. People need to work on their definition of “master set”. 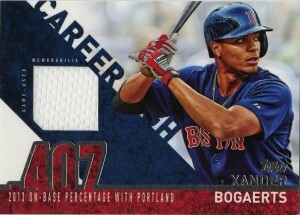 I like the idea of the “Free Agent 40”, but the explanation of the insert set is a little weird. “Free Agent 40 (15 cards, 1:8) looks at some of the biggest signings over the last four decades.” Ok, I get that, but “40” makes it sound like either the players are 40 years old, or there are 40 players in the set. I guess alliteration trumps logic. There’s a couple others out there as well, I forget if there are 4 or 5 on the checklist. I’m not terribly concerned with plain swatches these days, especially when they can be picked up for $0.99. I’m sure I’ll get some more eventually, but these two seemed like a good start. 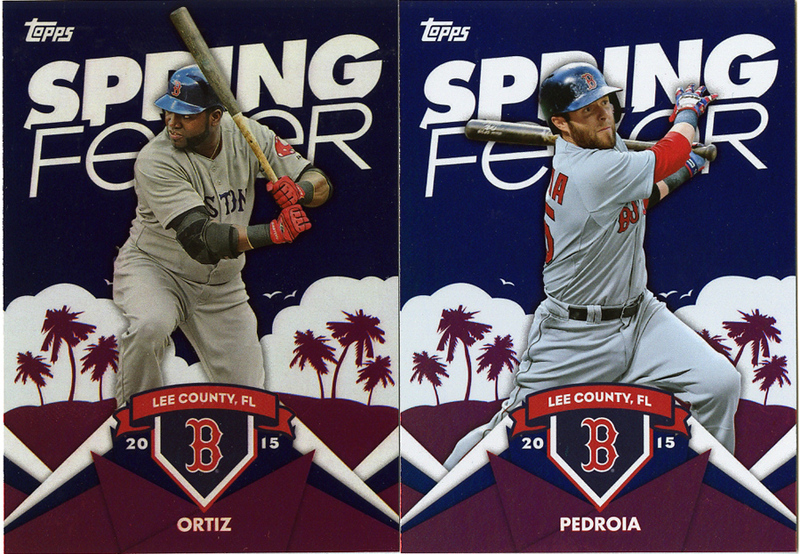 Lastly, from the same seller, they had some of the “Spring Fever” cards as well. 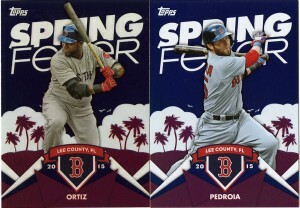 I was able to pick up the Ortiz and the Pedey, but they were all out of the Hanley Ramirez card. I’ll have to track that down, begrudgingly. Just look at that. Three refractors, two Chromes and MINIS! His note said “Hope you need a few of these”. Dude, I needed all of them! He even followed it up with another refractor, this time for ManRam, two Topps Flagship Minis and a sweet Yaz mini to boot. AJ, these are awesome. They totally made my day when I was super sick. I don’t know when I’ll send it, but a return bomb of epic cardboard has your name all over it.